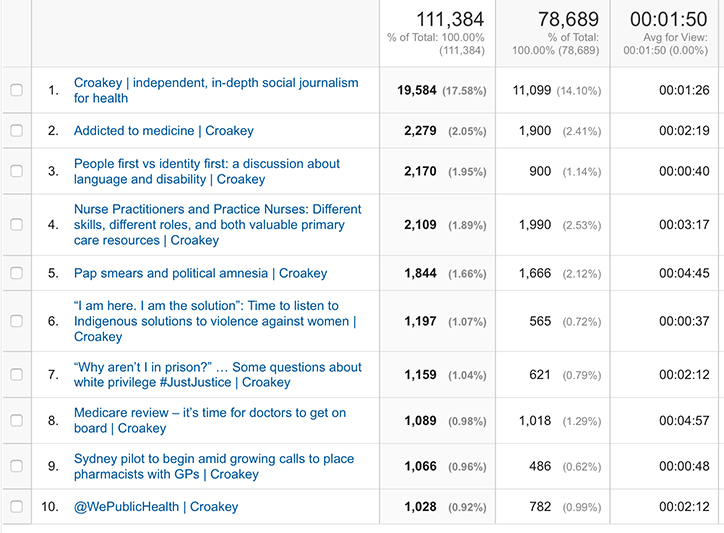 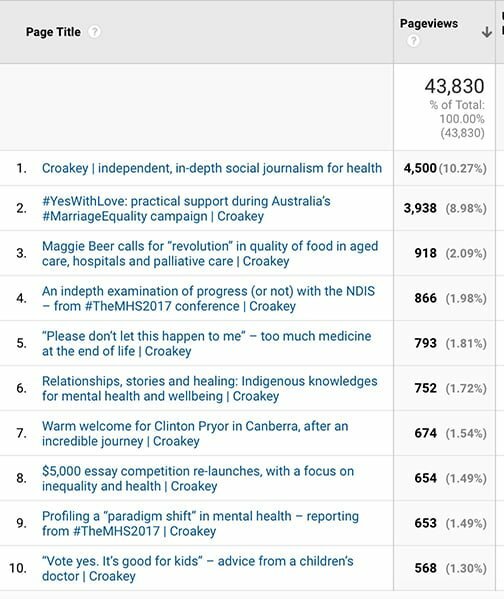 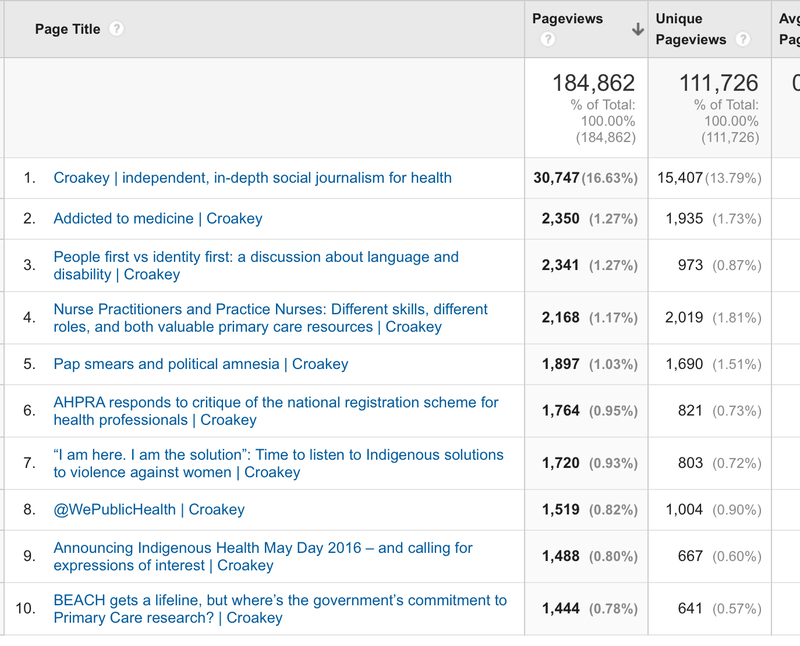 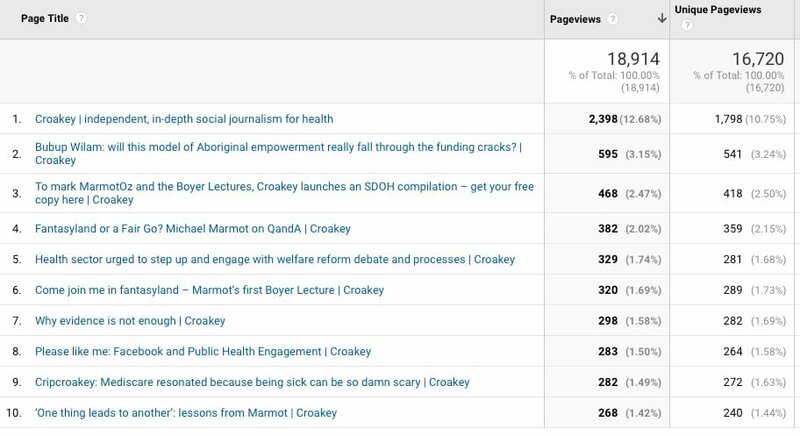 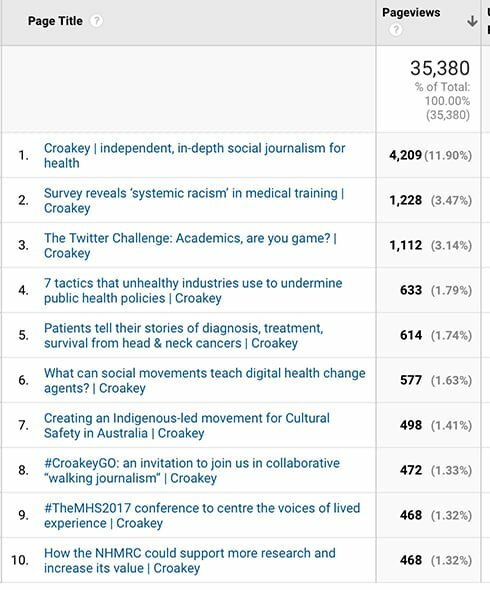 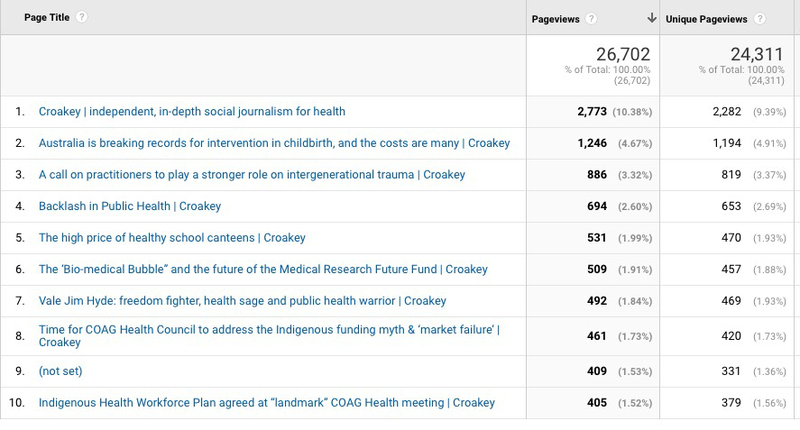 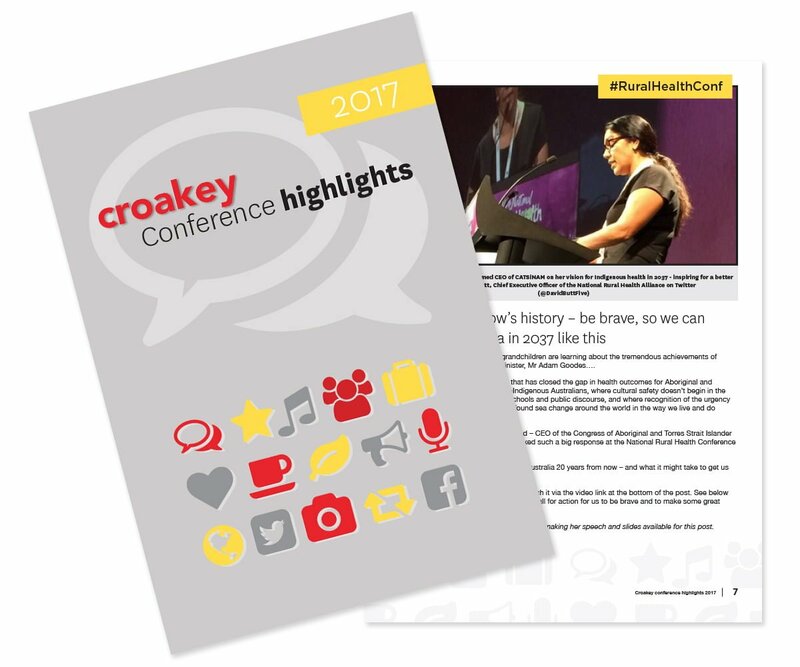 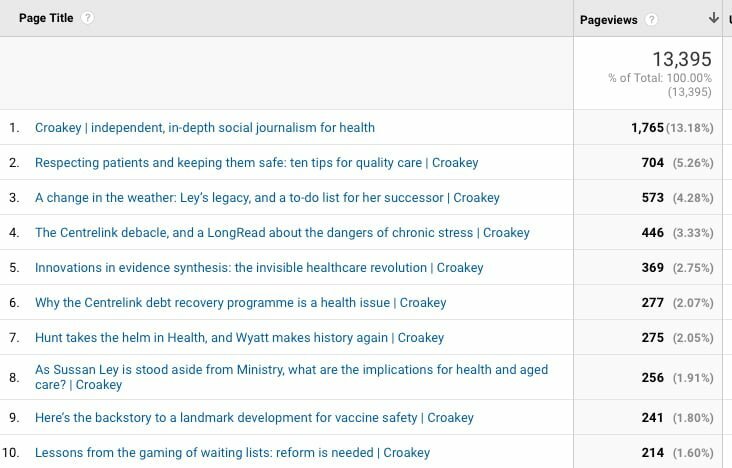 Croakey launched as a standalone site in September 2015; before then we were hosted by Crikey.com. We update the readership figures every 6 months, with cumulative figures since our launch in September 2015 posted each year. 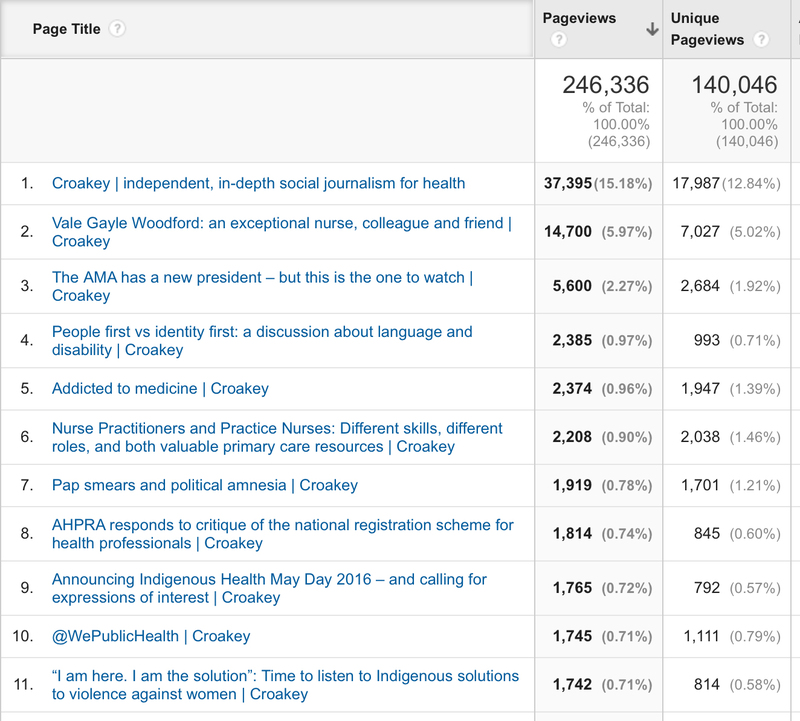 Below are figures for our analytics. They include Google Analytics for the website and for Apple News. 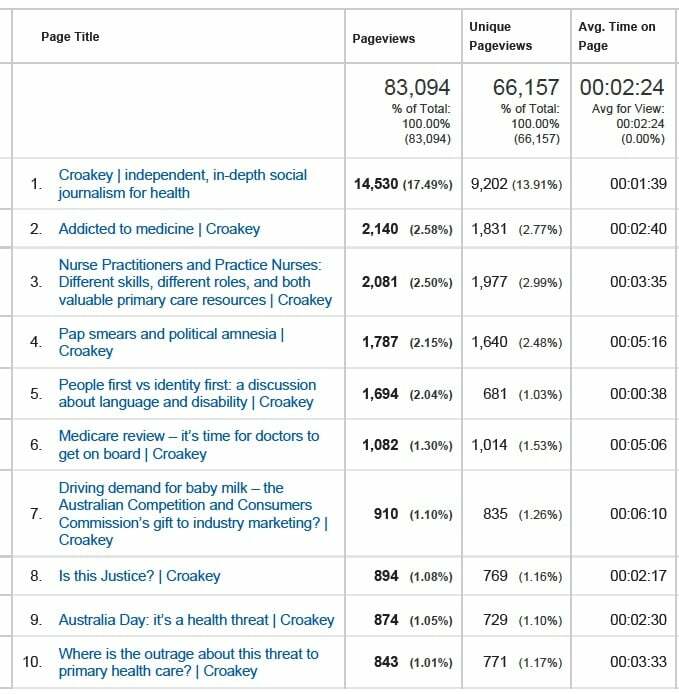 We have not yet started analysing and reporting our readership via FaceBook instant articles. 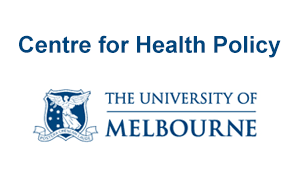 Website: Mandatory bicycle helmet laws in Australia: is it time for a change? 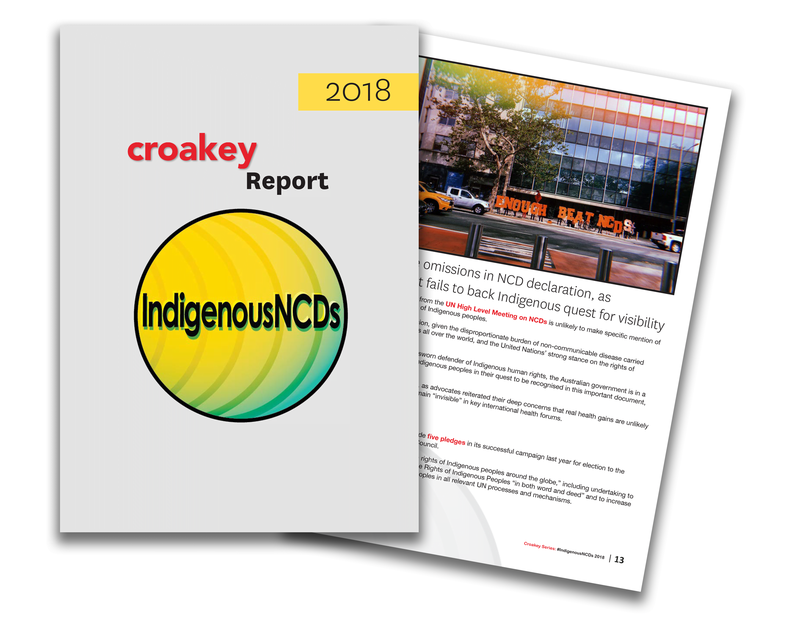 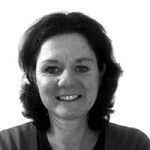 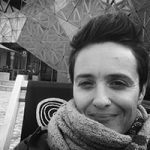 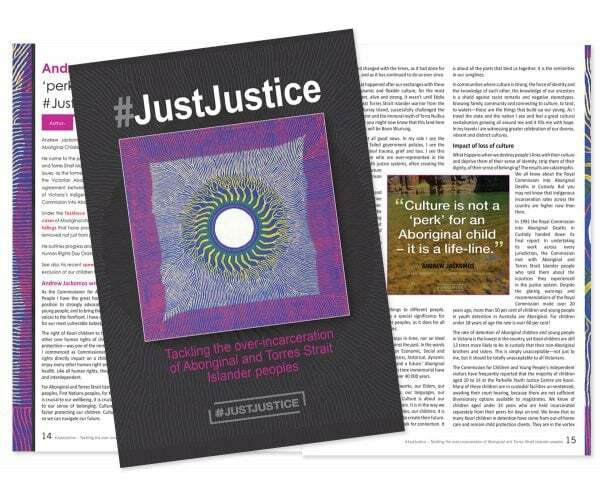 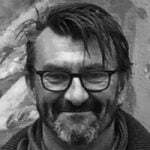 Website: Bubup Wilam: will this model of Aboriginal empowerment really fall through the funding cracks? 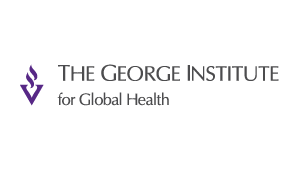 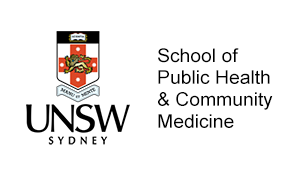 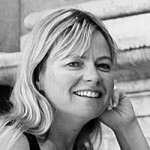 Website: Six steps towards effective action on obesity. 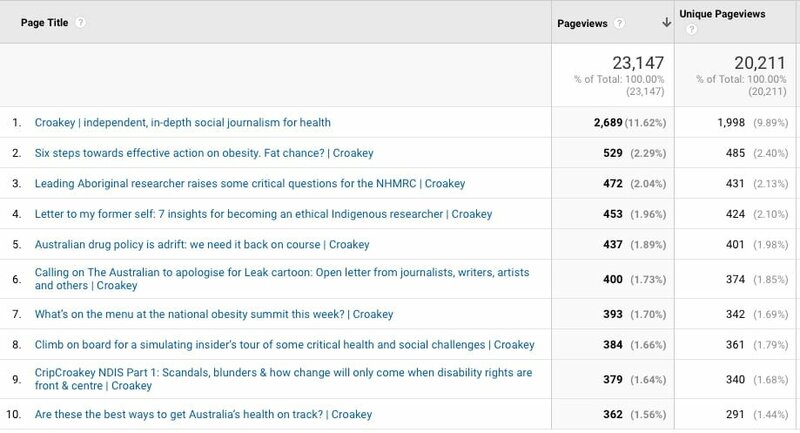 Fat chance? 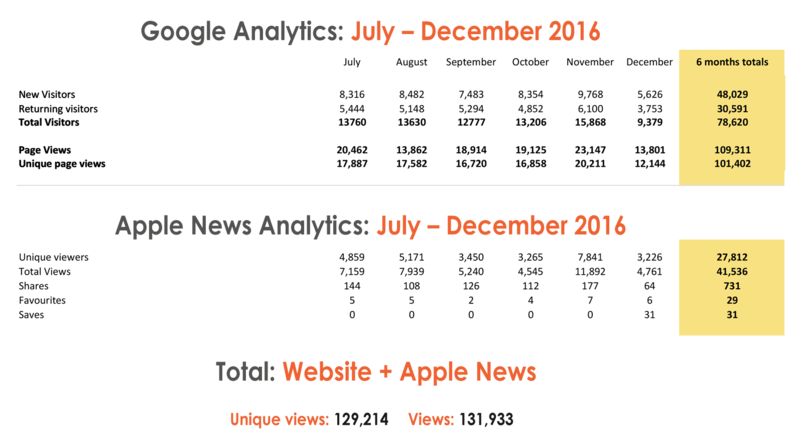 In addition to those figures above, in October, on Apple News there were 3,418 unique viewers and 5,203 total views. 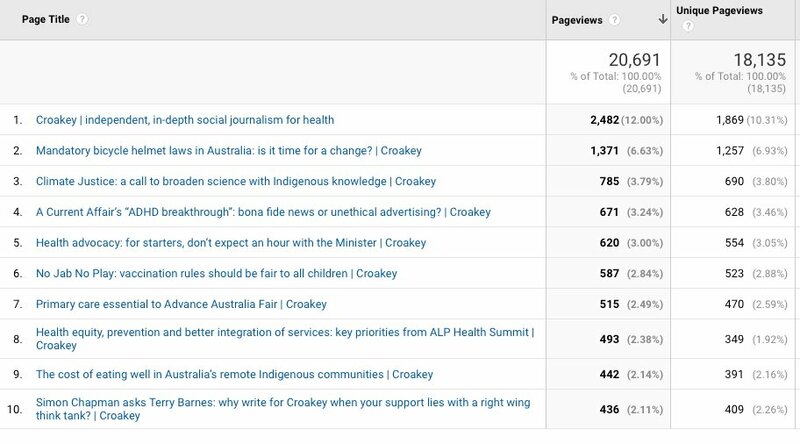 The top article on AppleNews was: Malcolm Turnbull, I hope you have your listening ears on. 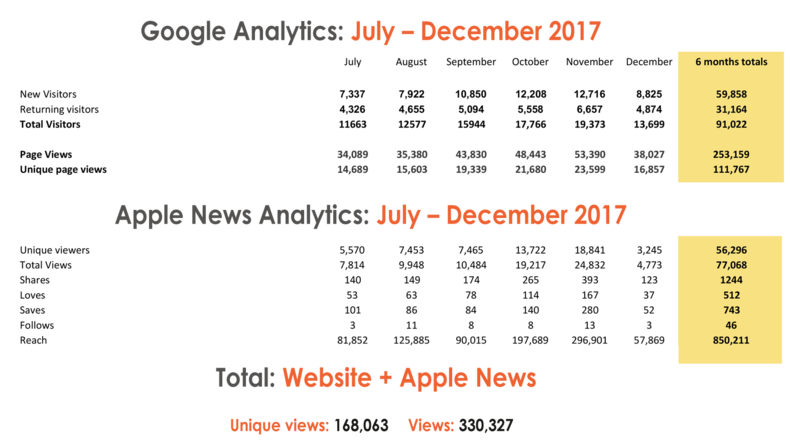 In addition to those figures above, in September, on Apple News there were 3,418 unique viewers and 5,203 total views. 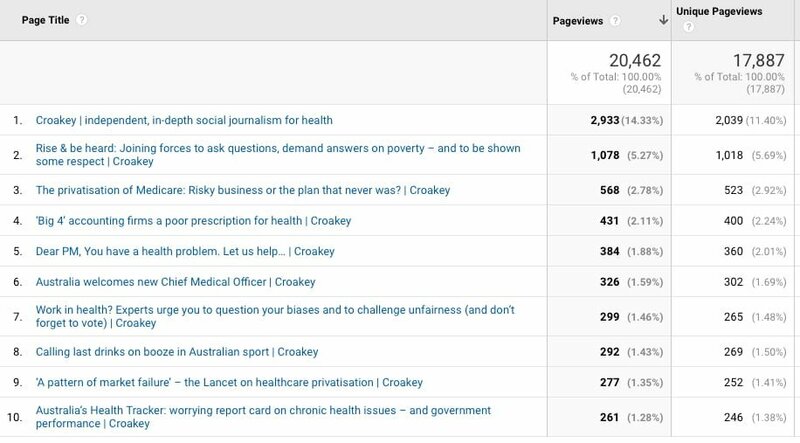 The top article on AppleNews was: Health professionals as vendors: the commercial erosion of evidence and ethics. 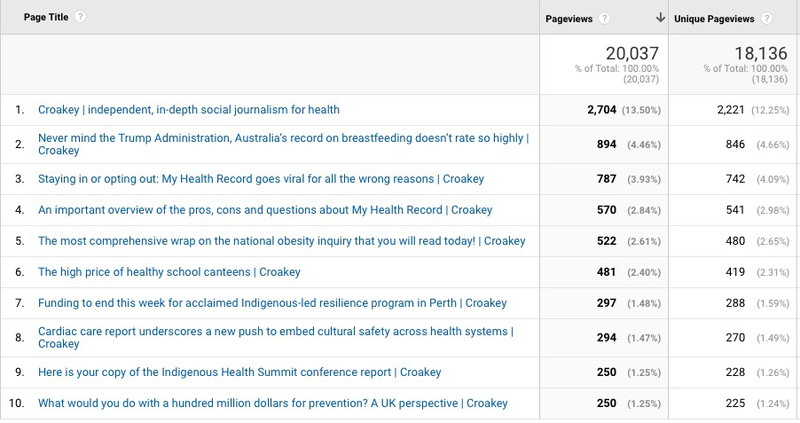 Below are the best-read articles/pages at the web-site in September. Top story on Apple News: The Olympics: faster, higher, stronger…unhealthier? 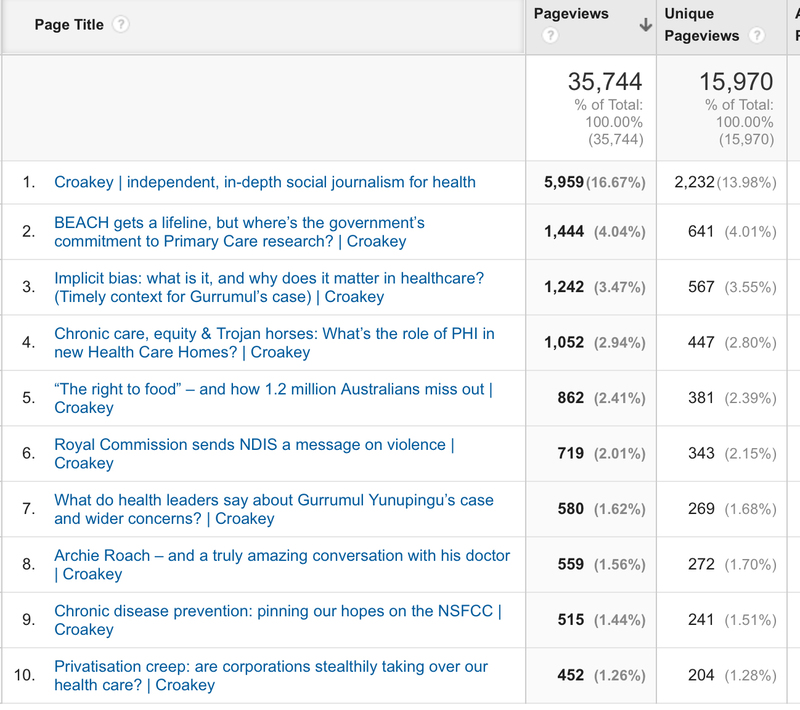 Below are the best-read articles/pages at the web-site in August. 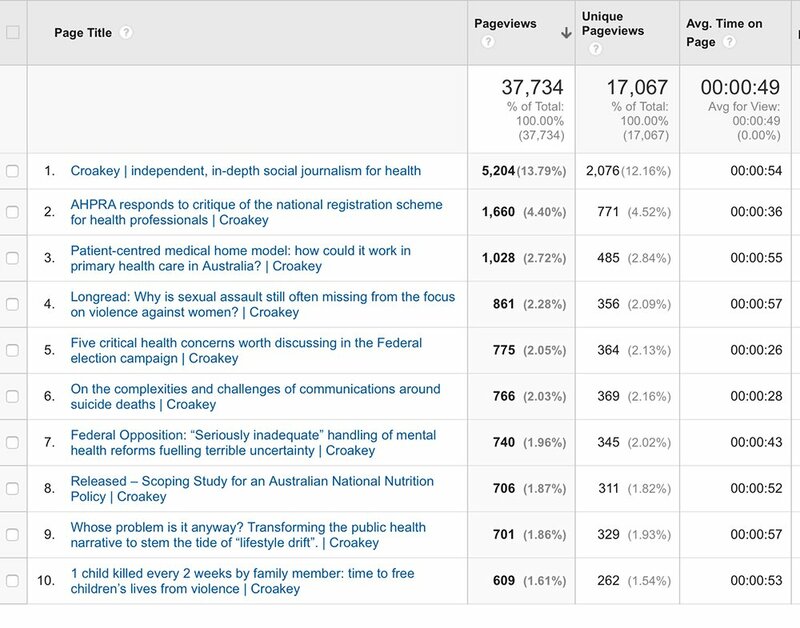 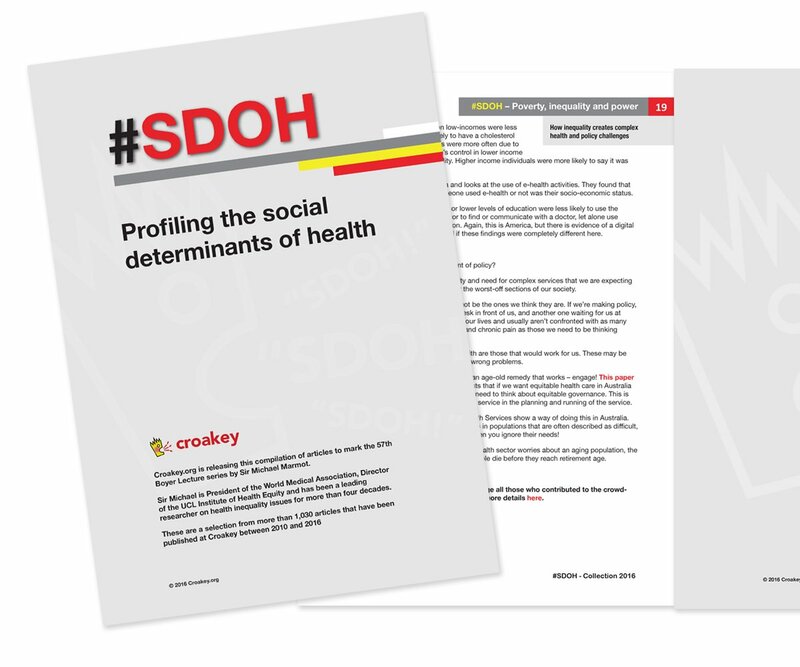 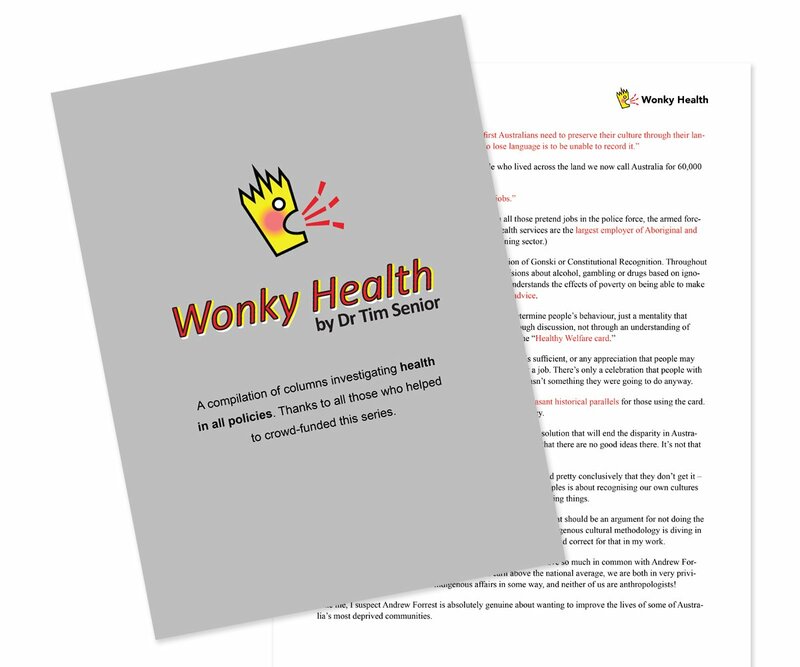 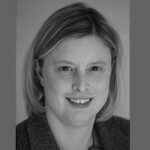 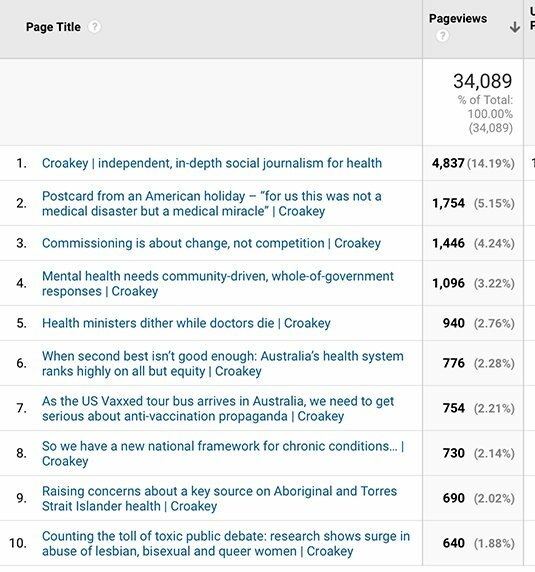 Australia – 1078 readers – top story – Health was top of the 2016 election agenda: but how healthy is the result? 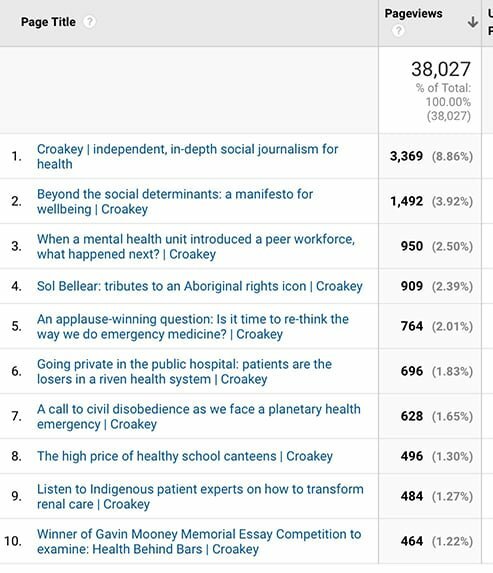 In May, Croakey launched as a channel on the Apple News app (please favourite us and follow our stories there!). 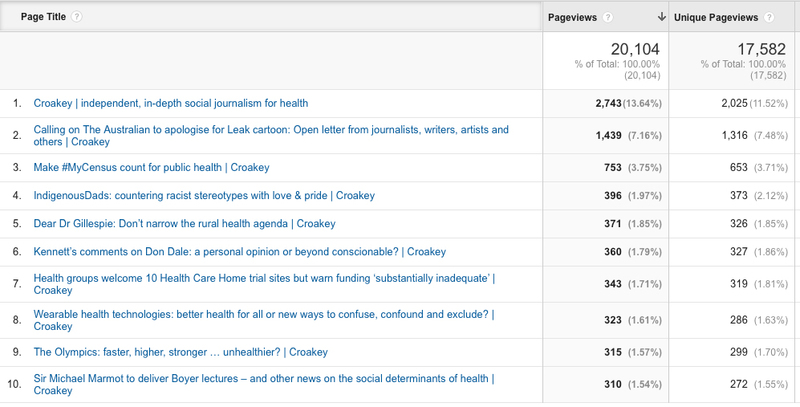 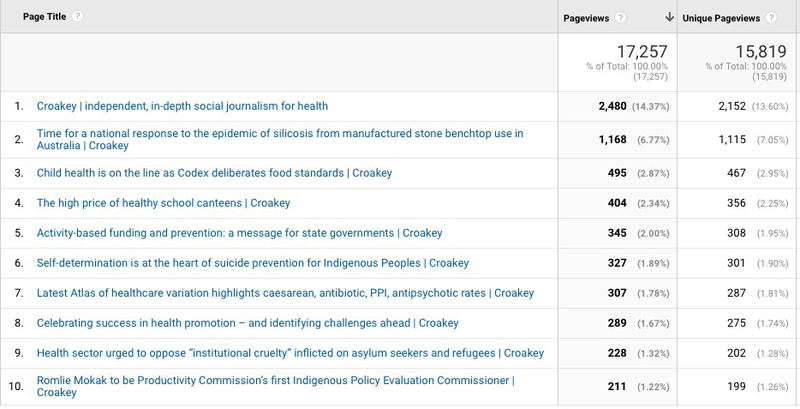 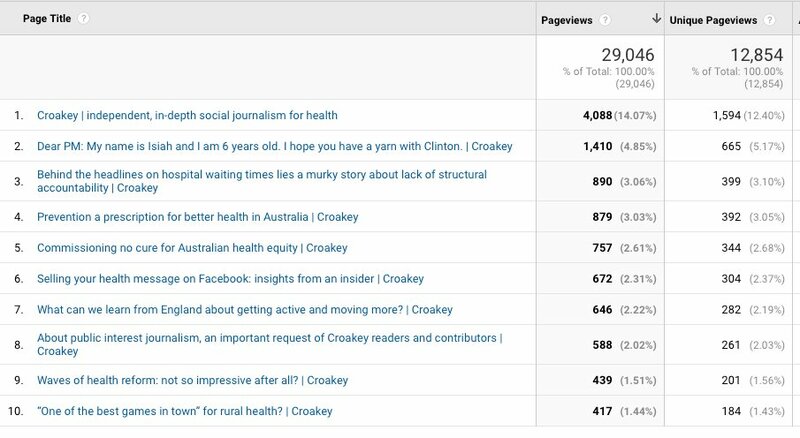 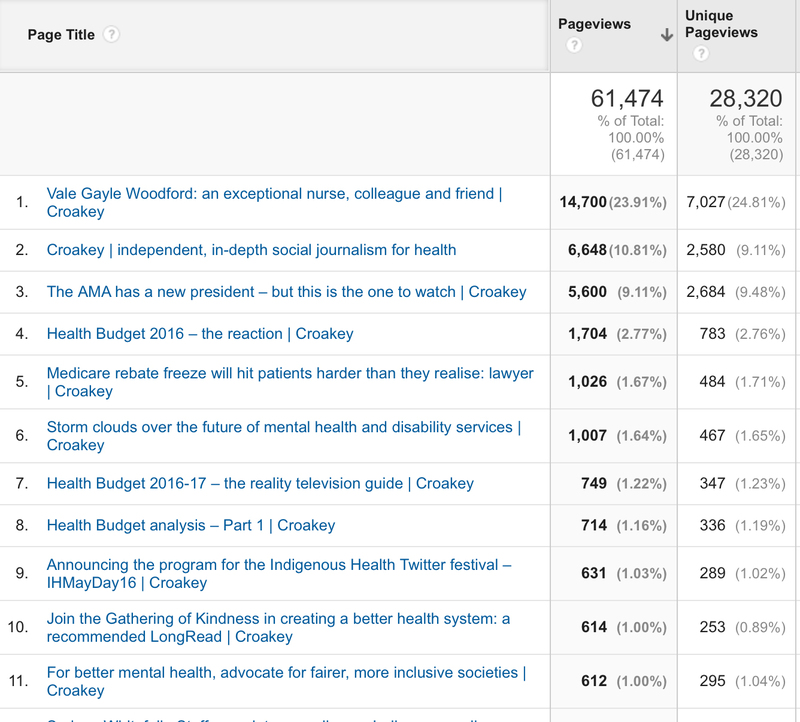 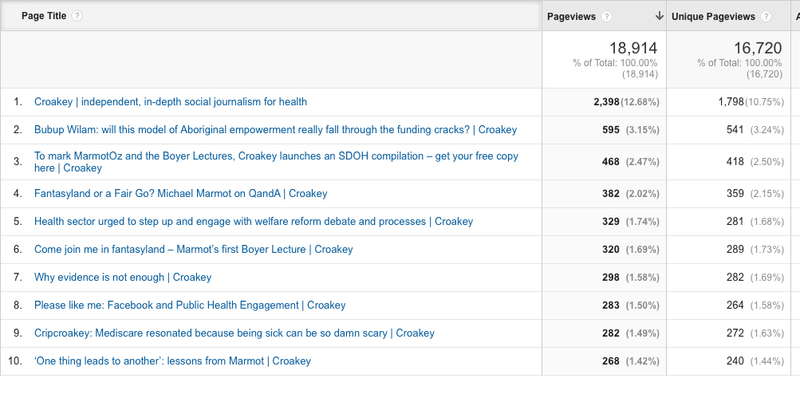 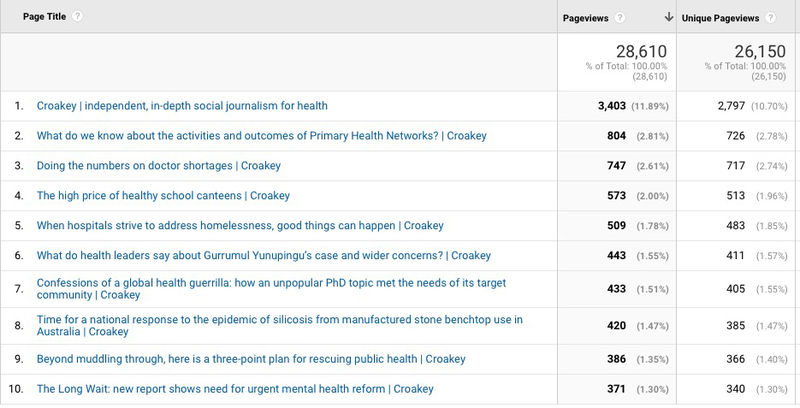 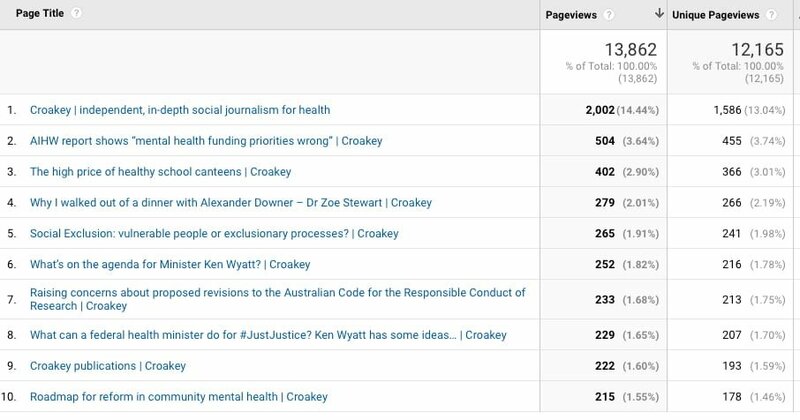 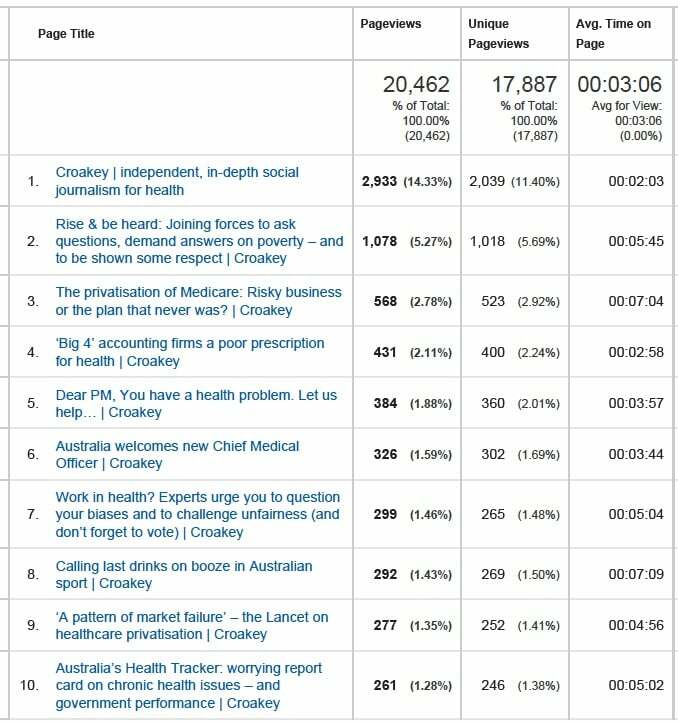 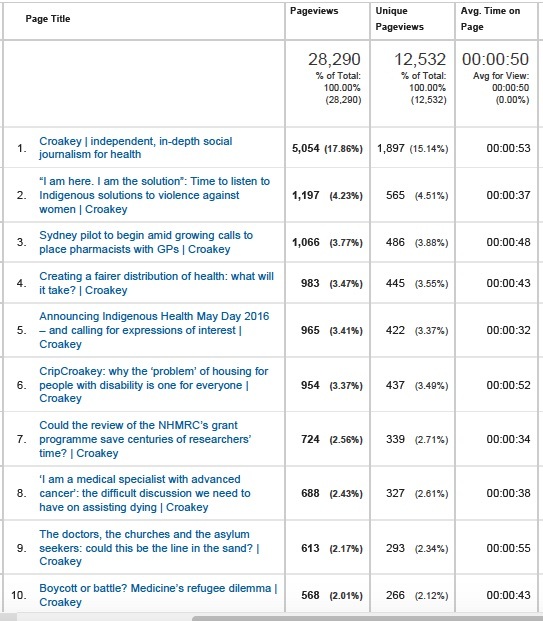 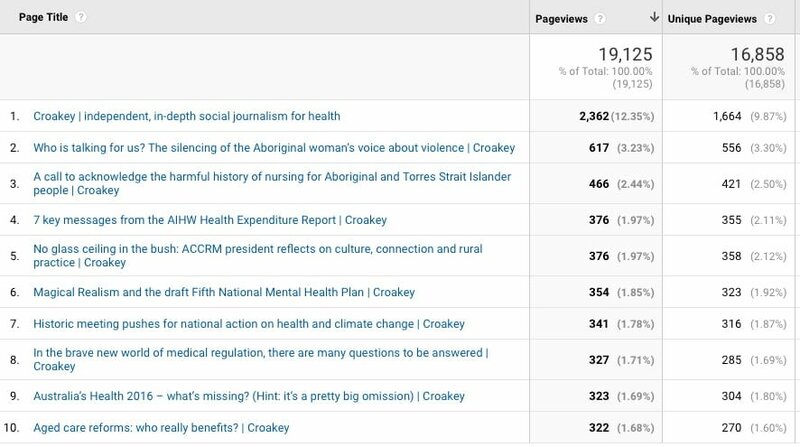 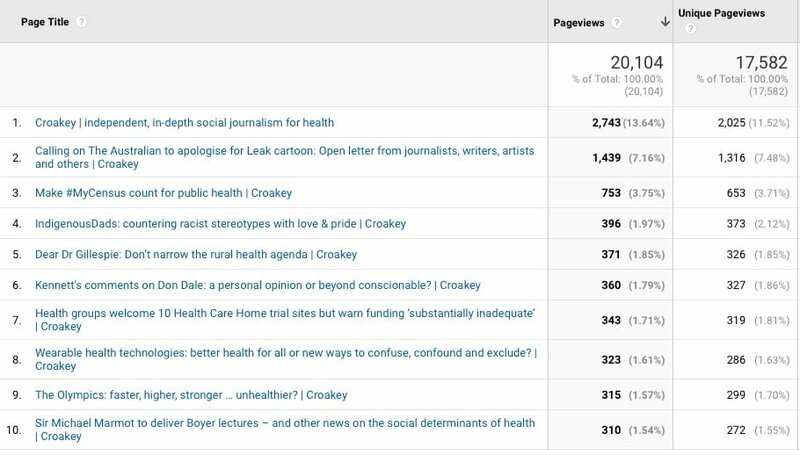 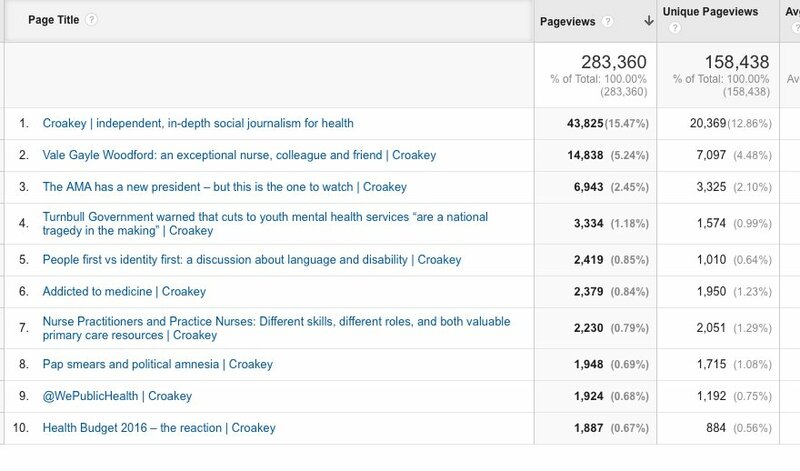 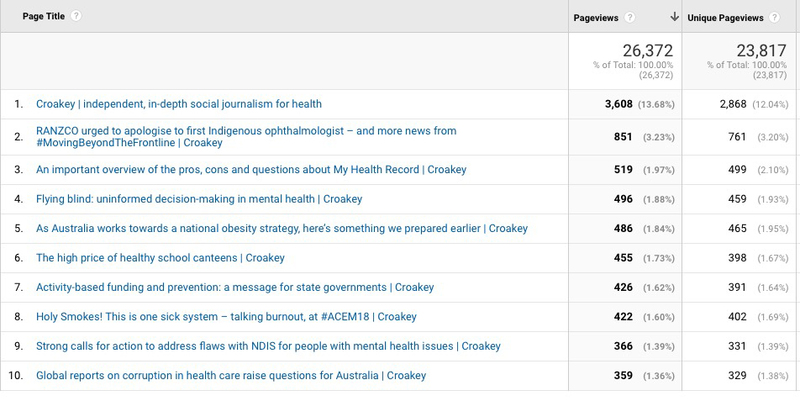 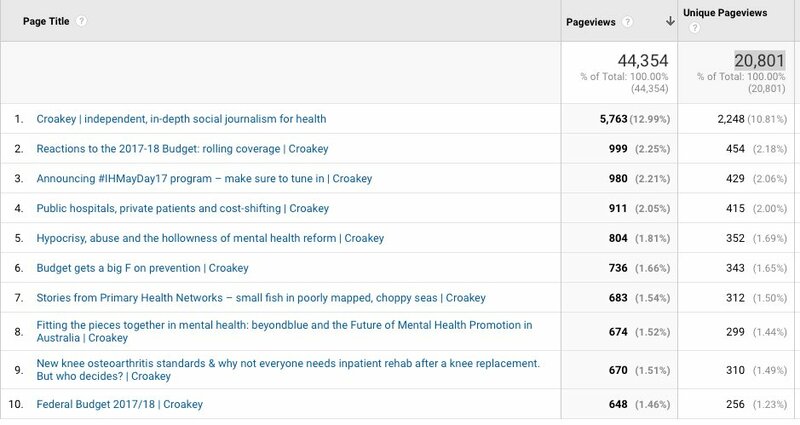 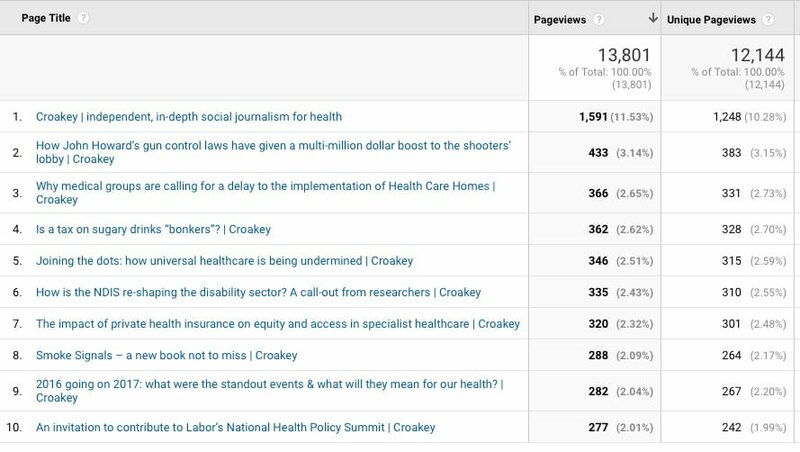 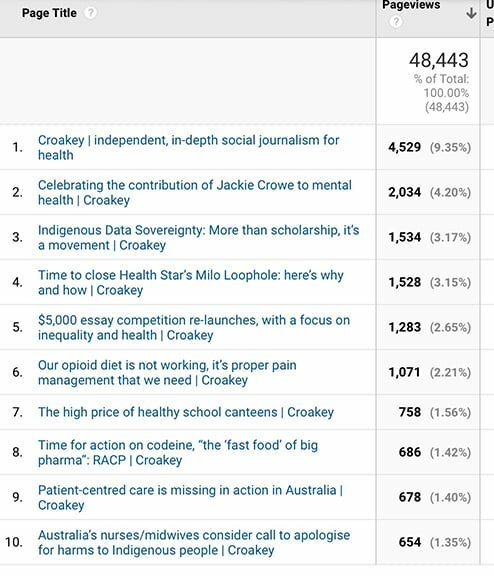 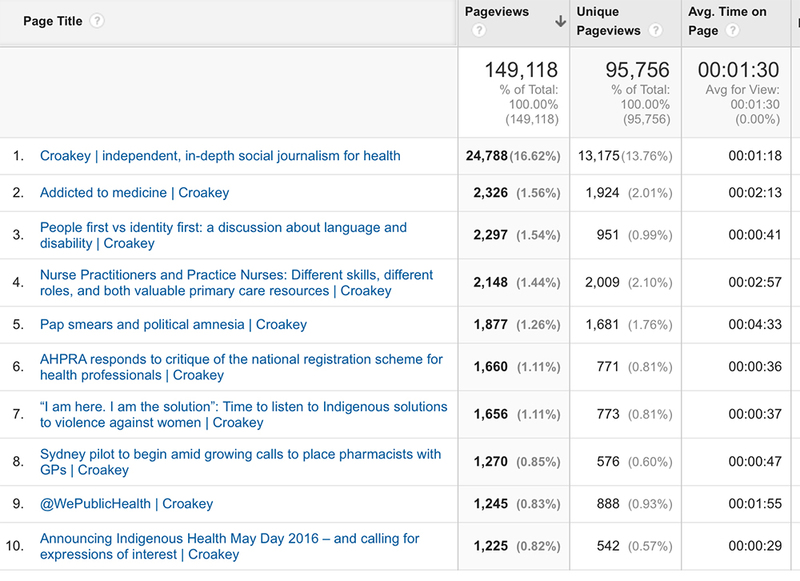 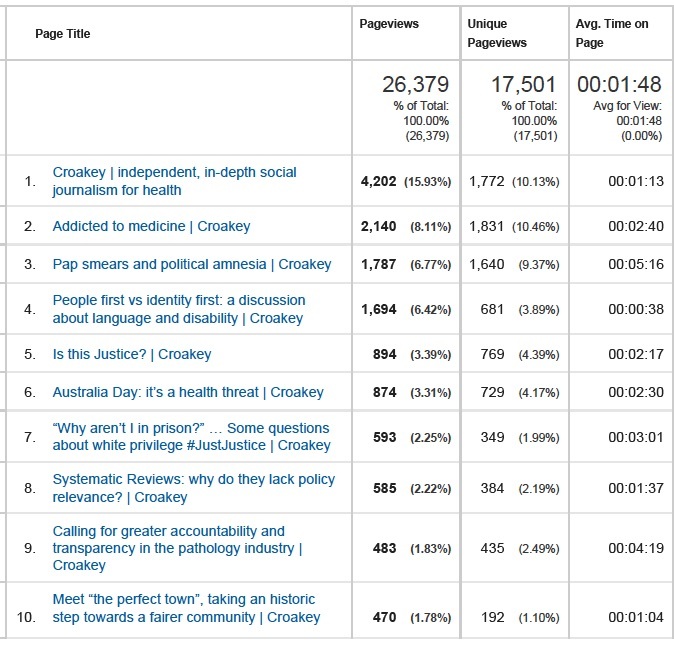 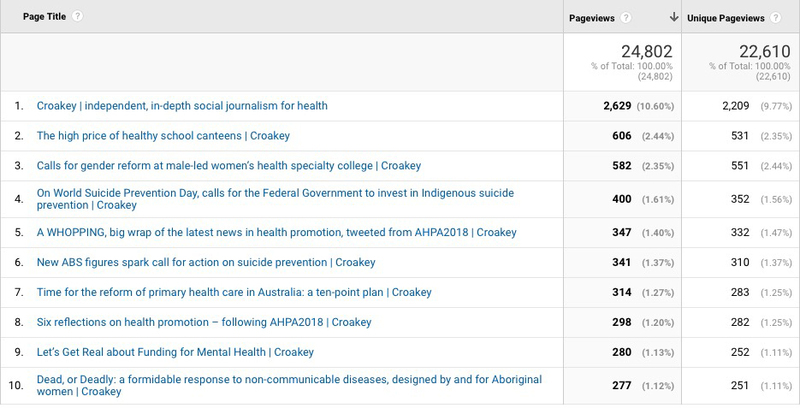 In the 30 days until 12 June, Croakey on Apple News had 3690 unique viewers (the number of unique users who viewed any article in this channel, and 4885 total views. 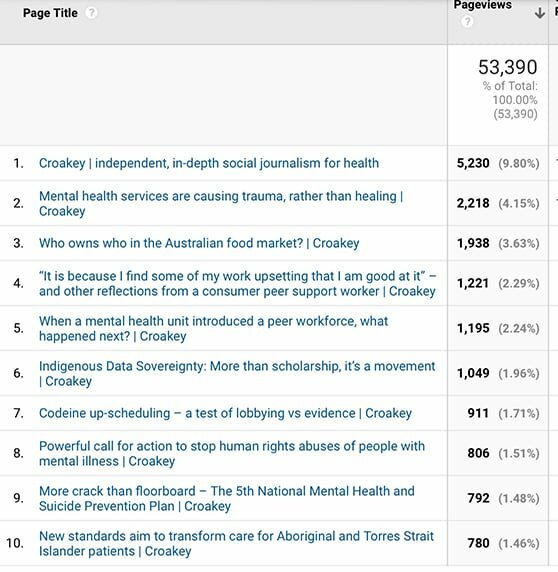 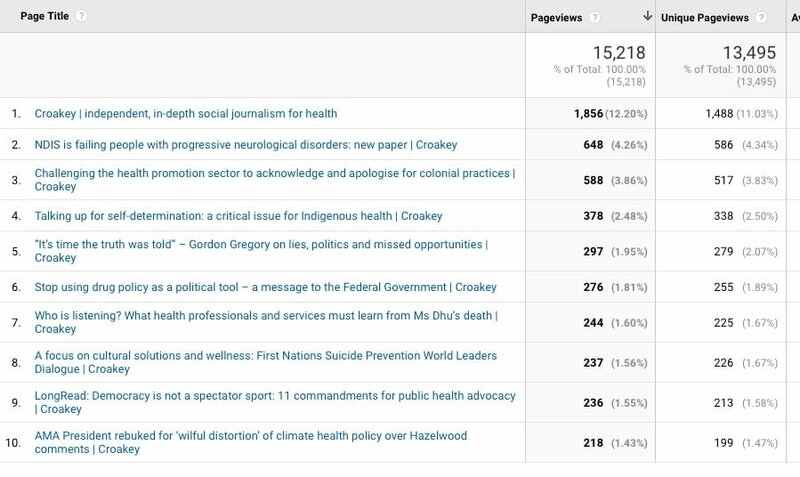 (Note, Tim Senior’s article on white privilege, #7, was published in August 2015, so the figures above do not include its total readership, at either “old Croakey” or “new Croakey).